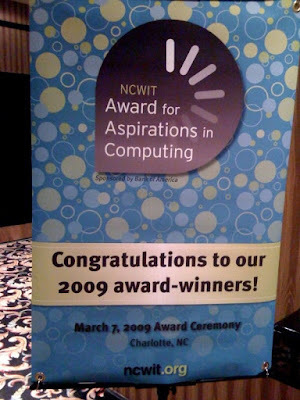 Yesterday our oldest daughter Gabby, along with 31 other other high school women, received an Aspirations in Computing and Technology award from the National Center for Women & Information Technology (NCWIT) and Bank of America at the Technology Stars of the Future Technology Showcase & Awards Ceremony in Charlotte, NC. At the ceremony, each of the young women were recognized for their outstanding aptitude and interest in technology and computing, leadership ability, academic history, and plans for post-secondary education. NCWIT is a coalition of more than 160 prominent corporations, academic institutions, government agencies, and non-profits working to increase women's participation in information technology (IT). Girls represented just 15 percent of Advanced Placement computer science (CS) exam-takers in 2006; that’s the lowest female representation of any AP exam. In 2007 women earned only 19 percent of all CS degrees. Back in 1984, women earned 37 percent of CS degrees. Women hold more than half of all professional occupations in the U.S. but fewer than 26 percent of all computing-related occupations. Only 13 percent of Fortune 500 technology companies have women corporate officers. Gabby had a blast at the ceremony yesterday, making lots of new female friends that have just as much of a passion and interest in technology as she does. Check out the list of winners linked here. Congrats to all the Aspirations in Computing and Technology winners!!! Congratulations, Gordon, on raising a tech-savvy daughter! You have a very cool career, and it's really wonderful to think that Gabby notices this and that it's been a factor in her own potential career decisions. This is great Gordon. Congratulate Gabby and congratulations to all the young women! Hey Gordo, surfing around and came across your blog. It has been a very long time - maybe 30 years? Those days in the lab at BMC seem like yesterday! Congrats to your daughter! This is wonderful news! !